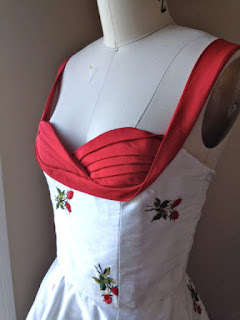 Gertie's New Blog for Better Sewing: About Butterick 5882: Straps, Etc. About Butterick 5882: Straps, Etc. Thanks for all your kind words about my new Butterick patterns! Your lovely comments make my day; I hope you all know that. I wanted to clarify something about the straps on B5882. As I mentioned briefly in my last post, I had intended for the straps to twist when worn. And, as it turns out, the folks at Butterick (while genius) are not mind readers. Who knew?! So I wanted to show you pictures of the dress as I made and styled it, so you can make your choice when sewing the pattern. Here's a picture I took in my sewing room, right after I finished the dress. See how the strap is turned down underneath the bust, and then twists at the side of the bust? This is how I draped the original pattern, so it helps eliminate any rippling of the strap. I feel like an idiot for not giving Butterick more detailed notes on the placement of the strap. Live and learn, right? Happily, the dress still looks fantastic on the model and I love everything they did with the photo shoot. Oh! 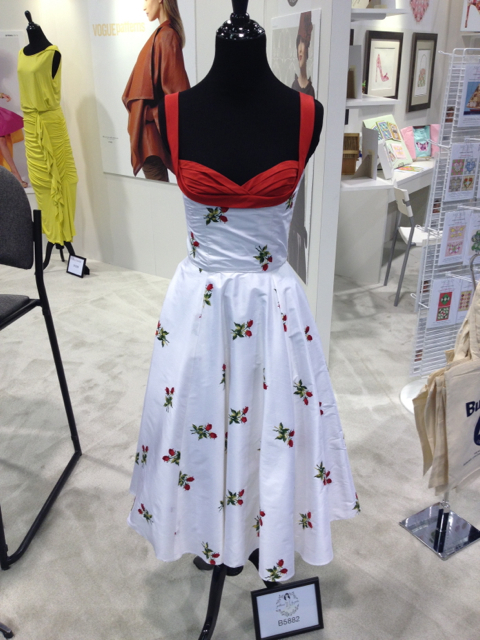 And here's the dress on display at the Craft and Hobby Association in Anaheim last month! This shows the dress without a crinoline, a more subtle look that works well also. Several of you asked about how to do an FBA on this pattern, so I'll be sure to write about that soon. Thanks again for all of your support! It means the world to me. P.S. Several of you mentioned waiting for a sale to purchase the pattern, and you're in luck! Patterns are currently $1.88 on the Butterick site. The sale ends this Thursday, February 28th. Thanks for the sale info I'm going to grab it now. And I really do just LOVE this dress!! I forget if it's this week or next week (and I'm too tired to go look it up), but they'll be $1 at Joanns' soon. A gorgeous dress! I wish to make one for myself one day. Maybe sooner than later thanks to the sale. Thanks for the hint! And huge congratulations on your book and everything else you've accomplished since the start of this wonderful blog of yours!!! I snatched both of your new patterns up! I also brought a few more I had my eye on as shipping was 12$ so I figured I should make it worth it. Wow. The dress looks great. Congratulations on the release of the pattern. Took advantage of the sale, so my patterns on its way. So glad you're planning to do an FBA tutorial for it so my tired brain doesn't have to try to come up with a method for it on it's own. I think it's wonderful that you went for the shelf-bust design for this season's pattern since those are nearly impossible to find in the vintage pattern market. Great timing on the sale! I also prefer your strap "twist" since it seems we also see a bit more red on your version of the dress. It makes more sense to me. But as you said, either way turned out beautifully. This dress is amazing! I can't wait to make one for myself. I LOVE the fabric you used too, where can I find it for myself? I got it at B&J Fabrics. If you call or email them, they're really helpful. This is such a striking design! I wish I had more fancy functions and less irrational fear of cleavage so I could actually justify making it. I'll just have to live vicariously through everyone's versions, which are sure to be great! Since you promised the FBA, I'm def. getting one now! I love the twist in the strap! Such a great detail, and how lucky are we to have the styling direct from the designer herself! Thanks, I have been checking Joanne Fabrics for this pattern to go on sale but I never have time to get to the fabric store so this is great. I want to make this dress for my New Orleans Jazz Fest vacation. This pattern to gorgeous,I've always love this bustline,Thanks Gertie! I will be buying it today! I am so in love with this pattern! Thanks for the pics of how it should be. It cleared things up for me! I love the dress and was tempted to buy the pattern, but was put off as the dress on the model made it look like the bust part was quite shallow............I am small busted, as is my daugther, so that part needs more coverage, due to our lack of shelf!! LOL. So, really pleased to see the dress on your dummy, which seems to show the bust cups as more balanced to the rest of the dress.......can you tell us, it looks like they have tucked under part of the cups as there are only 3 pleats and your dress has 5 pleats in the cup if you see what I mean. Could you clarify this. Your picture of the dress seems to be more in proportion to the rest of the design. Would love to know before I purchase the pattern.......Love your choice of fabrics by the way. Pleased to see that you are going from strength to strength. I keep on dipping in and out of your book and am enjoying it very much. I think it's because the bias band is flipped up in the Butterick photos, hiding some of the pleats. Love love love this dress. I can't resist a good sale so I will probably end up buying the pattern. I'm also enrolled in your bombshell dress class on craftsy. I was very inspired by a pleating technique in the latest Threads, that looks a lot like the pleats on the bust of this dress. So I'm thinking of incorporating that detail in when I make the bombshell dress, assuming it wouldn't add too much bulk to the bust area. Seeing on this dress makes me think it'll actually work. 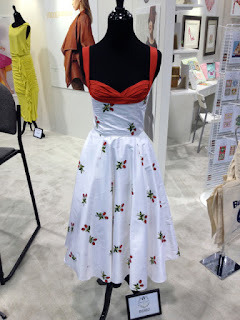 I'm also obsessed with having a retro cherry print dress this summer, and the fabric you used is making me swoon. Swoon! 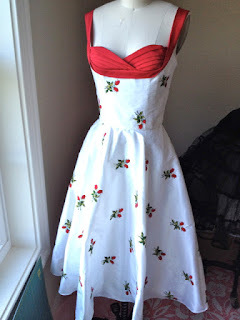 You would not believe how difficult it is to find a cotton dress weight cherry fabric on the wide world of the interwebs! I love that there's a way to make the shelf bust a little higher, and it really highlights the pleating more that way! This is such a gorgeous pattern! I'm so impressed, now I'm even more eager to learn so I can make this dress some day. Gertie, I am one of the people who bought your Starlet craftsy class. You have gotten a bad name at Craftsy - for the lack of interaction available, which is totally different to all the other instructors - and for the messed up lining pattern which just doesn't work... I have had issues with the patterns in your book too, and there is no way I will buy any patterns by you again - whether they're made by Butterick or not. If you want people to continue buying your stuff you really need to honour your commitments and practise quality control. I'm sorry you feel that way! You can get a full refund for the Starlet class, as it is no longer offered by Craftsy, which is why I don't participate in it. There was indeed a grading error with the pattern, and Craftsy felt it easier to pull the whole class than correct it. So they should have given you a refund anyway. As for the book, I'm not sure what your complaints are, so can't really respond there. But shoot me an email if you need help with anything! Thank you for adressing this! I have asked Craftsy for a refund now, will let other know if I get it. Also, I love your book, and as you are making a new one, my biggest issue with it was the pattern sheets. I had hoped for induvidual pattern sheets for each pattern, finding the right one was dificult. For your next book, could you consider making separate sheets for each pattern? If not, how about a color code, so it would be easier to follow the lines? This had given me so much frustration I have decided not to use the patterns at all and rather use your sections on tecnique and fitting. I love almost everything about the book, as well, but I agree color coding the patterns would have been helpful. I was still able to sort it out, but just for the sake of constructive criticism for your next book-- I'd gladly pay an extra buck or two if that's what it cost for color coded patterns. Seems I forgot to ask for an actual refund, and they did not offer me one in their answer, however they offered to switch it for another jacket course, a quilted jacket, witch includes a butterick pattern, including shipping. I guess I'll go with that! Have now purchased all of your butterick patterns. I was waiting eagerly for the spring patterns and am beyond satisfied! Your Bombshell class is still available on Craftsy. As you mentioned you don't participate in the Starlet class because it isn't offered any more, can you comment on why your support has been withdrawn from the Bombshell class? Thanks for the feedback, all! Could not agree more about the pattern sheets. We're looking at other options for book 2, I'm really hoping one will work out financially. Neurula, yes I can comment on that. Craftsy classes only require teacher participation for a year. After that, they generally appoint an assistant teacher. I want one!!! This dress is gorgeous! I love the dress, but it's a lot smaller than I am. Will Butterick ever issue it in larger sizes? I am trying to get through your Craftsy course too. I feel I need more time than anything. I watch and re-watch the videos until I get cross-eyed, but when I watched it all through and take a break, I come back and it makes more sense, or at least, I can see another way I can do it that makes sense to me. I hope to be done the dress before the End of Time. I'm really looking forward to your casual dress book. I'm hoping it will be an easier, kinder, gentler version of your couture book for the sewing doofus that is myself. The shelf bust dress pattern is completely out of stock already! I was all set to order it, too! There was some sort of glitch, but it seems to have been fixed now! Thanks for the sale tip ;) I went ahead and bought all your pattern, in both sizes :D I always do that since you never know when you'll need bigger or smaller. To make your version, did you just flip the bias tape down and it stay there? Yep, I just flipped the bias band down. It should stay there on its own, but you can also tack it in place if you like. I think it looks perfectly beautiful with or without the twist! And whooohooo, $1.88 patterns> Thanks for the tip! I am heading over to Butterick.com now. im looking for a sewing mach. and dont know what to buy i would like to make clothes but my husband wants it for more heavy duty things such as tents and camping gear. do you have any suggestions? I don't have Gerties expertise, but I would highly recommend starting with a used Singer in good condition. I picked mine up for a song when computerized machines became the rage. True, it only does four different stitches, but I have never found the need for more. It hasn't broken in fifteen years, and I do the maintenance myself. Just like with cars, the less computerized elements, the less to break down. I use it for apparel sewing, mostly vintage, so it fits :) I also repair my husbands canvas camping gear with it, renewing seams and adding patches. Hope you find the perfect machine! You might try a local sew and vac repair,they often have these great older machines. Having discovered your blog I have gone straight onto Amazon to grab your book and am looking everywhere for your Butterick patterns but can't find them. Are they being sold in the UK at all as I really really really want to make this dress? Thank you Thank you Thank you in advance for doing a FBA for this pattern! I'm an H cup and I tried on a dress very similar to this with the shelf bust at Trashy Diva. They were sold out of the color I wanted and I suspect that the shelf is supposed to go under your breasts rather than somewhere in the middle. I need to get this pattern now! Do you think this would work in seersucker or a nice quilters cotton? I'm thinking about getting this pattern (after there are instructions for a FBA! ), and I just wanted to clarify something: the bias band is supposed to sit at your underbust, right? It looks like it hits just below the fullest part of the model's bust. Very excited by this pattern. Do you know when this pattern will be available in Australia and does the sizing run true to size? Gertie, I am just finishing sewing this dress and I have to say, I love it! I am just having trouble with one thing... the strap under the bust. It is pesky and wants to flip up (like in the Butterick photo). Did you do any hand-sewing to keep it behaving? How do you keep it in place? BTW - I took your Bombshell course and LOVED it, too. I am in Phoenix and can't wait to hear where you are doing an appearance. I ended up doing just a little hand-sewing. http://thesewinglab.blogspot.com/2013/03/butterick-5882-review.html. Thanks for the pattern! I really like how it turned out. I just picked up this pattern and fabric last week. I'm glad I came across this before making the dress, now I can make sure that the strap sits correctly. I thought it looked a little off in the Butterick image. Overall it's a stunning dress and I'm psyched to make it! Just want to congratulate you on your line of patterns. I just found out about you and your blog today. Just wanted to say how beautiful this pattern is as I don't wear dresses hardly(prefer skirts and cute tops). Now I think I will make one for myself! Best wishes and can't wait to see your upcoming patterns.